We came to the end. 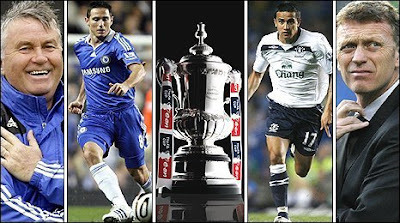 With FA Cup final, the curtain is falling at the football season in England. Considering odds, Chelsea is a clear favorite. They reached the final after overcoming Arsenal 2-1 in the semi-final, at the same place. Fans and management are happy with recent team performances. They have suffered only one defeat in 21 games under manager Guus Hiddink. In the race for Premier Chelsea didn’t have a real chance, paying a bill for wasted points and all mess that Scolari made. In Champions League they were eliminated after totally outplayed later champions. Thankfully to wrong referee’s judgments (I don’t expect anything such like that from Howard Webb) didn’t get a chance to face United again in big final. So, this is the last opportunity for silverware and my impression is the entire season will be judged depending from this game. Frank Lampard has given a boost by declaring himself fit. He sat out last week's win over Sunderland with a knock but will start at Wembley, with Alex and Juliano Belletti (virus) also fit. Deco and Carvalho have some injury problems, but their missing will be covered easily. In recent FA Cup campaign, Chelsea scored more goals proper than any other club (15) and conceded five. Two last games of these rivals ended with goalless draws, but another fact is Chelsea haven’t lost from Everton in last 22 competitive games! Players are in the mood to repay Hiddink for all effort he made for past three and a half months. Also, a trophy would be a big encouragement for the next season and attack for Premier. Toffees secured a top-six finish for the fourth season in five after three wins and a draw in their last four games. They beat champions Manchester United on penalties to reached this final. Before that, eliminated Middlesbrough and Liverpool. Probably is nonsense, but in each of the last four seasons, the club who knocking out Middlesbrough has gone on to finish runners-up in the competition. But, more serious sounds David Moyes has never experienced victory over Chelsea in any competition as Everton manager. He had a lots of problems with the injuries through the season, but made some impressive results at the same time. This time he has received good news on the injury front, with Phil Neville and Steven Pienaar fully fit following recent worries over hamstring problems. That should enable Moyes to deploy his favoured 4-5-1 formation and announce a game with small number of goals. In Premier League, Everton is considered like a typical “home team” with much better record at Goodison, than away. But, after the semi-final game vs Man.Utd. (also played at Wembley), they grab a point at Stamford Bridge, clearly showing they can play the games on the road. Long time injured are Arteta, Yakubu, Jagielka and Anichebe. The odds and statistics favour Chelsea - but that is exactly how Moyes and Everton like it. They will try to put a tough display, trying to keep a net and to threat from counter-attacks. On the other side, we’ll see who will join Drogba in attack. Malouda, Anelka, or both. From this choice depends the number of goals on this match (under, or over). Although I don’t like the odds (and yellow outfit for Londoners), I give a convincing advantage to Chelsea and go for their win in 90 minutes. William Hill and 188sports offer 1.75. Chelsea to win.